Over the last few decades, a once-obscure corner of India has gained recognition as home to some of the world’s most beautiful natural scenery. But an influx of tourism to the Kerala Backwaters is having a devastating impact on the lives of the people who have long depended on them. It is three o’clock on a Friday afternoon and Amritavally sits in a thin, blue nighty. Her garden around her is hard and largely bare, distinguished from the footpath that runs along its front only by a waist-high wire fence with a loosely swinging gate at its far end. Her taut, saturnine skin climbs about knuckle-like cheekbones, and a stiff wave of ashen hair falls smoothly over the back of her head. She began our conversation standing, but after a few minutes had to summon a nephew, and then a chair. She is 49 but looks older, and when she gestures over the quiet stretch of canal on which she lives, it is with a thin wrist whose movement is robotic and necessarily economical. “At one time, not that long ago, we could use the canals here for everything,” she says. “I grew up catching the fish, drinking the water, cooking with it, bathing.” The basic but spacious home behind her is one of many spread sparsely along the banks of the Kerala Backwaters, a 900km network of canals, rivers, and lakes on the south-western coast of India’s best-developed state. Behind that, one of the vast paddy fields that for decades have been the mainstay of the region’s economy, and in which Amritavally worked all her life. We are in the district of Kuttanad at the southern end of Vembanad Lake, the longest lake in India and the spine of a vast aquatic nervous system. This is one of the few places on Earth where farming is carried out below sea level, and summertime intrusions by the Arabian Sea once meant only one crop could be grown here each year. Work on a dam at the lake’s northern end first began in 1965, but repeatedly stalled due to a lack of funding. Then, in 1975, a collective of farmers spent 21 days filling in the last missing portion with a mud embankment that is only this year to be replaced by concrete. With the completion of the Thanneermukkom Bund, an additional crop could be grown each year, and Kuttanad was to become known as the Rice Bowl of Kerala. Life here still depends on the Backwaters. Their freshwater irrigates the paddy fields and the rice that grows in it is harvested and exported. After each crop, the water is let back into the canals to carry a fleet of kettuvalems—long, thatch-roofed houseboats, distinctive to Kerala and traditionally used to transport rice and spices—that serve as private, waterborne hotels for tourists from the West and India’s urban centres. Each year, before the first and larger of the region’s two monsoons begins, the Bund is opened and a current of seawater is allowed to cleanse the canals. When the rains arrive at the end of May, the villagers are forced to vacate the lowest-lying houses, but when they abate in August, the waters and the earth have been replenished. Local guides who tour the canals on kayaks and punts look forward to the currents. Since the Bund was installed, it has been periodically opened to keep the Backwaters from becoming stagnant, but in recent decades the process has become necessary to keep them navigable. Visit in March, and on this extraordinary palette of greens and oranges and browns you will see lifeless spots of white and grey: plastic bags, plastic bottles, cartons, cans, shoes, paper, and the occasional carcass. Everywhere are signs of a problem that plagues much of India. But it is only part of what has spoiled the water here, and it isn’t what made Amritavally ill.
Until the late 1980s, the Backwaters didn’t exist as they do now, as a tourist attraction. Kerala’s economy was fuelled by the agricultural exports that still flow from it today—rice, mussels, coconuts, rubber, pepper, nuts, and spices. A habit of electing Communist governments to its state legislature had left it with strong trade unions, successful programs of income and land redistribution, and development indicators unmatched anywhere in the developing world. Its literacy rates and life expectancy were and remain among the highest in India, its rates of birth, malnutrition, infant and maternal mortality, and domestic violence among the lowest. The founding argument of the UN’s Human Development Index—that wealth should not be the only measure of growth, and that poor countries can improve quality of life using social policy alone—was based in part on case studies of Kerala. Nevertheless, a poor state it was. In 1986, its per capita GNP was $182, while that of India as a whole stood at $290 and the average for the world’s 37 lowest-income countries was $200. So the Kerala Tourism Development Corporation, an agency of the state government, set out to encourage tourism and the revenues it would bring. It adopted the slogan ‘God’s Own Country’, and launched a marketing campaign with the Backwaters as its spearhead that has since won awards and seen Kerala Tourism recognised as a global super brand. In 2017, foreign and domestic tourism brought into the state $4.9bn, and over 5.5m visitors passed through those districts containing the Backwaters alone. On a normal day, he would be guiding kayakers down the canals’ narrower offshoots and under bridges too low for the kettuvalems to pass. How about Parth, who silently captains our boat from its stern? When the Backwaters are busy, he rents out the boat for $30 a day; otherwise, he tends to his paddy field. And his friend, who has come along for the ride? Drives a tuk tuk in Alappuzha. Babu, who we passed not long ago, tethering a small boat with an outboard motor and well into his sixties? Owns a paddy field and a cow whose milk he sells for 50¢ a litre. And how about Devarajan, who limps between a clay furnace and the tables of the café where we have stopped? He’s been a paddy farmer for 46 ears and owned the café for 14. Why did he open the cafe? Every farmer I speak to tells a similar story, the more surely the more years they have been working the fields. Fertiliser has long been used in rice cultivation here, as it is all over the world. But as tourism boomed, and as oil, domestic waste, and the toxins they contain made their way from the houseboats into the water supply, crop yields began to suffer. So the farmers did the only thing they could to protect their livelihoods and the food supply: they used more fertiliser. And more fertiliser was emptied into the canals when the fields were drained after each harvest. “But the fertiliser makes the water even more polluted?” I ask. A knowing smile and a nod. Stand watching the flow of houseboats down any of the wider canals here and you will notice a few things. First, many of them are huge. The kind of yacht-like structures, long enough to have five or six windows on one side, whose size is quite difficult to gauge unless someone is standing on deck to provide scale. Second, there is often no one on those decks. This is an exclusive form of accommodation, typically air conditioned and catered, costing perhaps a fortnight’s local wage for a night and carrying no more than one or two families. The cost of the boats themselves is well into the tens of thousands of dollars. Third is the rainbow shimmer of oil where the water meets the walls of the canal. Though Amritavally has stopped drinking that water, around 40 per cent of the people living here still do. Up to 80 per cent are thought to use it for other daily needs, around a third of those without boiling it first. A three-year study that concluded in 2001 found that over 50 per cent of the chemicals being used in the paddy fields here were “highly toxic”, and studies going as far back as 2006 have found residues of “around ten different pesticides in alarming concentrations” in Vembanad Lake. Then in 2009, studies began to emerge establishing elevated and increasing rates of cancer in Kuttanad. A complete survey of the region is currently underway, but in the latest figures from the Kerala Health Department, released in January of this year, the rate of people receiving palliative cancer treatment in one bloc of villages containing 67,000 people was more than three times the national average. Among the cancers reported in large numbers are those of the blood, bladder, skin, and intestine. The science of what causal link exists between chemical exposure and cancer in humans, and thus whether a danger to the population here might have been foreseen, is in its relative infancy, but the medical literature all points in the same direction. It has been known since the early 1980s that certain compounds released after the ingestion of nitrate, the major ingredient in many fertilisers, can cause tumours in mammals. The World Health Organisation lists numerous common ingredients of pesticides, including DDT, which is used in Kuttanad, as probable carcinogens. Sena is an Accredited Social Health Activist, known colloquially as an ‘aasha’, the Hindi word for hope, in the Kuttanad village of Kainakary. She is one of nearly 900,000 activists—typically literate, well-established women—appointed in villages across India and tasked with promoting health education, providing midwifery, and treating minor ailments. Since ASHAs were introduced in 2005, their work has been instrumental in, among other things, reducing the rate of infant mortality in India by 32 per cent. 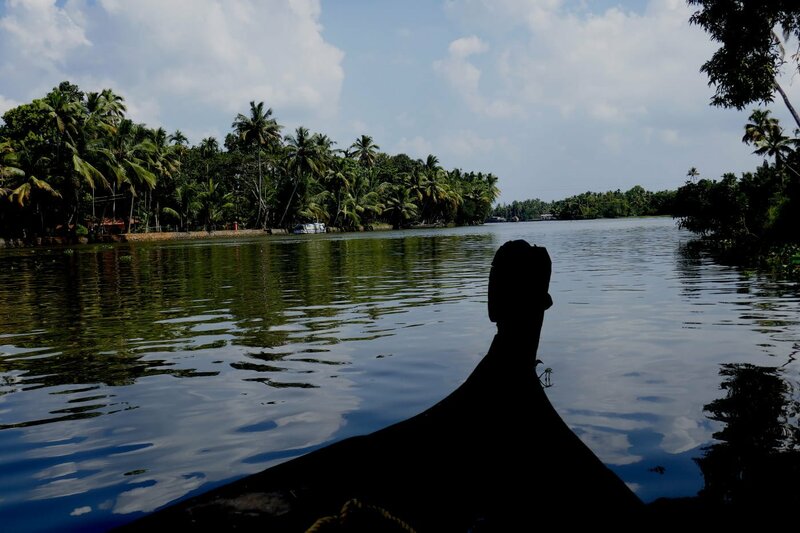 A physician visits each village in Kuttanad every two weeks, and a water ambulance has recently been launched in Alappuzha to improve emergency access to areas with little road connectivity, but for many, ASHAs are otherwise the only point of contact for routine medical care. In 2014, Kerala became the first state in India to offer free cancer treatment to low-income patients at all government hospitals. When fully implemented the scheme is expected to cover 47 per cent of the population, but a stigma around cancer is making its emerging prevalence here harder to address. Cancer stigma remains a problem across India. Despite the country having a young population and a relatively low incidence overall, misconceptions about the disease, including that it is contagious, synonymous with a death sentence, and the result of bad karma, persist. Instances have been documented of sufferers being segregated within their communities, having to prepare their food separately and use their own utensils, and having their diagnoses withheld by their doctors at their families’ request. The stigma is strong enough to be a problem even among migrant communities. In one case reported in 2017, an Indian woman living in the UK died having sought medical attention for breast cancer only once her breast had begun to rot. When, earlier, I had tried to probe Amritavally for details of her condition, I felt the conversation quickly begin to close, and it is with Sena’s words in mind that I raise with villagers the prospect that they are paying for the benefits of tourism here with their health. But Mohan, who I encounter with his friend, Uday, shirtless and hacking casually at scrubs outside his home with an old but sturdy-looking machete, responds with an assured nod. “You hear about it more and more,” he says. “I know people who are ill. Not in my family, thank God. But most people know someone. Everyone knows there is a problem, but sometimes there is no alternative but to use the water from the canals. Mohan is 63, Uday, 53, and, like most people I meet of a certain age, they have been maintaining paddy fields here for more than three decades. But unlike most, the have no sideline, and say they don’t profit from tourism at all. Then was life better for them before the tourists came? “Yes,” says Mohan quickly. He looks at Uday, and they have a long exchange in Malayalam before turning back to me. To make matters worse, Kuttanad has in recent years begun to suffer acute bouts of water scarcity. A lack of rainfall in 2016 forced the region’s farmers to abandon 1,500 hectares of paddy crop to which they had devoted six weeks’ of labour. Then in March of this year, a lack of functioning water treatment facilities caused a scarcity of adequate drinking water to reach fever pitch, forcing villagers to either buy from private suppliers, drink from the canals, or, in the worst-affected areas, rely on water distribution by the state. The problem of clean water access is very different in Kerala than it is elsewhere in India. Visit Delhi or Bombay or Bangalore, and bottled water will be a constant in hotels and middle class homes. But each of these cities has water treatment plants, and locals, by and large, can drink tap water without suffering ill effects. When contamination does occur, it is usually the result not of the water having been improperly treated but of fissures in the aged pipes through which it travels to people’s homes. But in rural areas, treatment typically takes place in much smaller, more primitive facilities that are not well maintained and are much more expensive to run. “People in Kerala are generally very spread out,” says Dr. Absar Kazmi, a professor of environmental engineering at the Indian Institute of Technology, Roorkee. “That’s a problem we don’t have in most of India. In the cities, you have lots of people close together, so it is cost effective to collect lots of water in one place and treat it thoroughly. If you test that water when it leaves the plant it will be good quality. In rural parts, that’s often not true, because people are using only smaller plants or infiltration wells. Following the disruption in March, the Kerala Water Authority did begin to lay water pipes from the Neerattupuram Treatment Plant, 20km south of Vembanad, to additional villages in Kuttanad, but much of the area still lacks the infrastructure to provide reliably safe water en masse. The use of ever more fertiliser has also begun to undermine the ecosystem of the Backwaters—the very feature that made them marketable in the first place—and thus the livelihoods it is intended to guarantee. Fertiliser contains the nutrients necessary to promote growth in plant life, and can increase the yield of a crop by anything from 50 to 100 per cent. But its use needs to be carefully managed. If more is applied to a crop than can be absorbed, it will be washed (or, in this case, drained) into nearby waterways. That can cause a process called eutrophication, in which the accelerated growth of algae on the water’s surface blocks sunlight for the plant-life beneath and ultimately leaves the water incapable of supporting life. The problem is measured in terms of milligrams of carbon per cubic metre per hour, a figure which in the Backwaters rose from 80 in 2000 to 200 in 2014. Even the more organic methods being used to bolster yields here are known to deplete the fertility of soil in the long-term. Stubble burning involves the setting alight of the straw left behind after each harvest. The process does release into the soil important nutrients, like phosphorus and potassium, that help the next year’s crop, but it also forfeits to the atmosphere others like carbon and nitrogen. The opening of the Bund does transfer pollution to the ocean, but it replaces it with a salinity that limits the amount of water a rice plant can absorb and damages the cells in their leaves. In some areas, farmers have even tried to grow a third crop each year where once there would only have been one. Attempts have been made to tackle the pollution at its source. In late 2013, the Kerala government announced that it would no longer be issuing new licences for kettuvalems. Even operators of the smaller boats used to transport day-trips now have a window of only one month in each year to apply for a license. But this has proved a difficult industry to regulate. There are 740 kettuvalems registered in the Alappuzha district but at least 1,200 known to be operating, and some estimates reach as high as 2,000. Since 2014, each of their owners has been mandated to visit a sewage treatment plant, installed by the state government, three times a year to have their septic tanks emptied and cleaned. But in the three years following the introduction of the measures, a period in which just the registered boats should have clocked up 6,660 visits, only 1,000 were recorded. The state has also sought to halt the encroachment by development works onto areas under paddy in Kerala, which in the six years to 2008 fell from 322,000 to 229,000 hectares. Once the rice from that paddy is sold to the government, the majority is exported, generating revenue for the state. The Conservation Of Paddy Land And Wetland Act of that year made it a criminal offence, punishable by a minimum of six months in prison and a $700 fine, to reclaim or remove sand from wetland. But again, regulations are being circumvented by those with the means to do so. Thomas Chandy is Kuttanad’s representative in Kerala’s state assembly and the assembly’s richest member. He is an entrepreneur with business interests in private schools in Saudi Arabia and Kuwait as well as a controlling share in the Lake Palace Resort, which perches on the banks of Vembanad Lake. In October of last year, Chandy was forced to resign as transport minister after a Right to Information request, whose publication he tried to block with a petition to the High Court, implicated him and a number of state officials in an attempt to buy and fill in three acres of paddy land. The plot was to serve as his resort’s new car park. More broadly, the Kerala government has been reluctant to curb development within the state and imperil the income brought to it by tourism and investment. In 2011, the national government appointed a team of scientists to survey the ecology of the Western Ghats mountain range, which bounds Kerala to the east and run-off from which feeds the state’s rivers, as well as the Backwaters. The panel identified manifold threats to the region’s ecology, including deforestation, soil erosion, and damage to water quality and flow as a result of sand mining. It concluded that the entire region should be designated an “ecologically sensitive zone”, that development and other industrial activity should be heavily curbed. But the state government responded only that the report’s recommendations were “impractical” and that “Kerala can protect its environment with the provisions of the existing laws”. Between those lines are the demands of financing a modern state. Yet Kerala’s per capita GDP is four times higher in real terms than it was in the 1970s, when the success of its economic model, and its focus on quality of life as well as state income, were first noticed. That model is not now being discredited, but slowly diluted. Above all, this is a false economy at work. Tourism revenue routinely grows by ten per cent year-on-year, and continues to be courted. But the very environment that draws it is becoming saturated like thousands of others around the world, while the people to whom it has long been a home have little choice but to live according to their own short-term interests. At the top of Aditi’s garden is another basic but spacious home. Beyond it, another vast paddy field, a one-acre corner of which another life has been spent tending. The air is close, uncomfortably so, and from every direction comes the constant whisper of insect life. The tips of the grass form such a still, uniform emerald they could be solid ground. In a few weeks, the rice will be harvested. Much of it will be cut by machine, the rest, by hand. By people, like Aditi and Amritavally, standing shin-deep in polluted water, for hours each day, before going home to wash in it. “We carry on,” says Aditi, smiling. “I’ve been farming here for decades, my family even longer, and every year it carries on.” But what in another ten, twenty years, I ask. The new economy of the Backwaters, the burgeoning tourism, the agriculture, demanding more and more from less and less land. Can it be made sustainable? An influx of tourism to a once-obscure corner of India is having a devastating impact on the lives of the people who depend on its environment. The problem of clean water access is very different in Kerala than it is elsewhere in India. In rural areas, treatment typically takes place in small, primitive facilities that are expensive to run and not well maintained. This is a false economy at work. Tourism revenue routinely grows by ten per cent year-on-year, but the very environment that draws it is becoming saturated like thousands of others around the world.